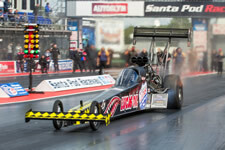 A Drag Race is an acceleration contest between two vehicles over a flat, straight distance of normally a quarter mile, or in some instances, an eighth-mile. 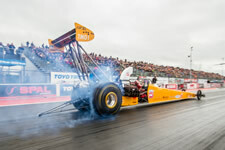 Both vehicles compete from a standing start and the contest is run after qualifying in tournament style eliminations, the loser being eliminated and the winner progressing till there is one driver/rider left. The race is started by means of the 'Christmas Tree', a traffic light system in the centre of the track just off the startline. 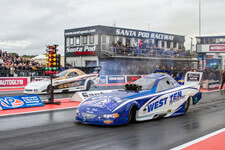 The racing machines front wheels are moved into light beams across the startline that detect the vehicle, these coupled with the finish line sensors activate individual time and speed clocks for each lane. The lights on the Pro Christmas Tree count down, amber then four tenths of a second later, green. A Sportsman Tree has ambers that flash at five tenths of a second, as opposed to the Pro Tree, at four. The race is then on, first to the finish line is the winner unless a red light shows in that lane, meaning the vehicle left before the green and is automatically disqualified. Another infringement is crossing the centre line. In certain classes they run on an index, a set time (i.e. Super Gas on 9.900) if they go quicker than that, again they will be disqualified. In some cases of two competitors both causing an infringement in the same race, a 'first or worst' rule will apply. Listen to the commentary to update you. Handicap racing allows slower vehicles to compete on an equal basis with the quicker machines. Having set qualifying times the slower racer gets a calculated head start on the quicker vehicle. Theoretically, they should cross the finish line together but it generally goes to the person who has the best reaction time (r.t.) away from the Christmas Tree, a 0.400 second r.t. is a perfect Pro light, 0.500 a perfect Sportsman light. To make life more understandable the reaction time is shown as plus or minus 0.000, with the triple zero being a perfect r.t. Minus is a red light! Check out the finish line scoreboards for all that information, then time and speed appears and the winning lane is lit up. There are many classes of race machine and eligibility is based on various requirements and specifications. These include vehicle type, engine size, fuel, vehicle weight and allowed modifications. Take a walk into the pits and among the race machinery, the crews, riders and drivers are quite happy to talk, but do give them some space if they're busy thrashing to make the next round! It is also a chance for photographs and autographs take your souvenir programme for signing and make it an even more collectable item! If you fancy a trip down the quarter mile, you can try attending one of the many Run What Ya Brung weekends and drive or ride your own vehicle on the track. It's a fun day out and you never know what race machines might be testing adding to the excitement.